This full pan acrylic display holds 3 full size baking sheets. The two hinged doors in the back make stocking you case easy. Take your pastries straight from the kitchen to this full plan acrylic display. Full size baking sheets not included. This Full Pan Acrylic Display offers a Valuable way to show your merchandise. 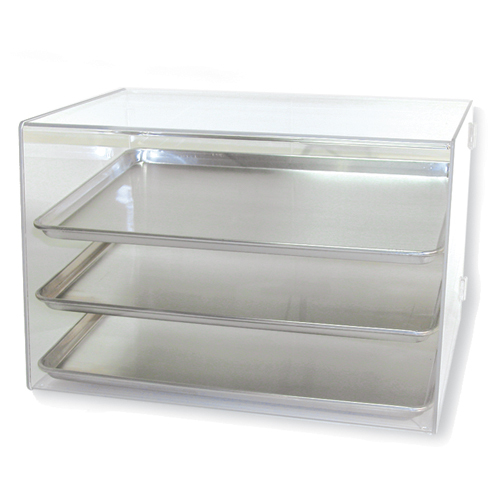 Designed with clear Acrylic, this Countertop Pastry Display, Food Display is proven to meet your merchandising needs. Buy Full Pan Acrylic Display now - Use our convenient shopping cart or give us a call and place your order with a knowledgeable service representative today!